Two years ago during the scorching summer of 2012, July 1936 lost its place on the leaderboard and July 2012 became the hottest month on record in the United States. Now, as if by magic, and according to NOAA’s own data, July 1936 is now the hottest month on record again. 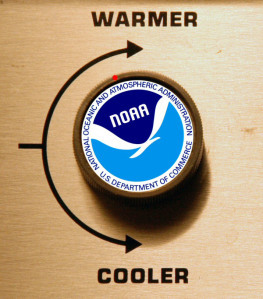 The past, present, and future all seems to be “adjustable” in NOAA’s world. See the examples below. The temperature adjustments story has been brewing for weeks principally due to the many posts at ‘RealScience’ but taken up by others, for example, Paul Homewood, see here and here. Judith Curry has a great post about it here, as does Anthony here. Are there only ‘computer models’ for things that ‘melt’ and things that ‘heat up’? Or do climate experts have a model that correctly predicted record Antarctic sea ice growth? Nobel Laureate Albert Arnold Gore Jr. said there was a 75% chance the Arctic would be ice free this summer, but in fact we have seen quite the opposite. The amount of sea ice on Earth is 4th highest on record for the date, and the highest since 1996. Bravo Mr Heller, and thank you for exposing the ‘raw’ climate truth, with all the wit, candour and precision that has made Mr Steven Goddard and “Real Science” such an honest and reliable source. My name is Tony Heller. I am a whistle blower. I am an independent thinker who is considered a heretic by many people on both sides of the climate debate. The animation below starts at the 1999 version, and progresses through 2013 – showing how they year after year tweak the measured cooling data to create the appearance of a warming signal – which does not exist in the thermometer data.